Now taking bookings for the 2019 Season. Check our Calendar for availability. Our Downtown home is on the east side of Atlantic Avenue between Second and Third Street (no streets to cross to the ocean), close to Bethany’s town center and just steps to the ocean and the boardwalk. Open the sliding glass doors from the living room or bedrooms to the decks for wonderful ocean views and breezes. Large, partially shaded main deck is a great place to relax, enjoy your morning coffee, BBQ or crab feast. The 2 bedroom decks are a great place to read while listening to the ocean and watching the waves. The rooftop deck, offers a commanding view up and down the coast of the beach and the ocean. The Gourmet kitchen includes a Wolf gas stove, The fabulous master suite includes an extra large two vanity bath with steam shower and chromatherapy “bubble” tub, and a full size washer and dryer. The beach is just 40 yards from the back of the house and there is off street parking for 5 cars. We supply 12 beach chairs. Our location and spacious interior are perfect for extended families that want to park the cars for the week and vacation at a fantastic house with in town location. The house sleeps 12, with four queens, a bunk bed with double on the bottom, twin on top, and a “kids chill out” room with a sleeper sofa and big screen TV on the lower level. High Speed Wireless Internet. A second Washer & Dryer are on the street level. The house has two water heaters, one is an endless Hot Water heater. Steps from the boardwalk and the town center, you will enjoy your family's most treasured time: summer vacation in our Bethany Beach home. It offers in-town and ocean block safety for the kids (no streets to cross), with spectacular views of the ocean from multiple decks. No hassle with parking meters. Walk into town after dinner with kids or grand kids for ice cream and free concerts on the boardwalk, Monday Movies on the Beach or Thursday Beach Bonfires. The sounds of the wind and surf are constant and refreshing. Our home has been decorated and appointed to anticipate your every need while on vacation. Bethany's beaches offer swimming, sunbathing, surf fishing and other water sports. Its quarter-mile boardwalk, within 50 yards of the house, is a great place to take an early morning stroll or just sit and watch the dolphins play. Shops and restaurants are all within a five minute walking distance, so you can park your car and relax for the week. The beach has life guards from Memorial Day through Labor Day. There are several restaurants in town including Ropewalk, Bethany Blues, Mango's on the ocean, and 14 Global among others. There is miniature golf in town. Up the road just 25 minutes away is Rehoboth Beach with limitless restaurant choices, and its famous tax free outlet stores. toilet, combination tub/shower, Private Shared Bath with Seperate Vanity for each bedroom. Italian Travertine Master Bath is a vacation retreat in itself with Steam Shower, Bubble Tub, and his & hers vanities. Master closet has full size Washer & Dryer. We are in downtown Bethany Beach at the North end of the boardwalk. No parking issues as we have off street parking for 5 cars. We are on Atlantic Avenue on the Ocean Side of the street. So no crossing any streets to get to the beach. It's out the door and one minute away! Bethany Beach and boardwalk outside your door. Enjoy after dinner ice cream with the kids, free concerts and Monday Movies on the beach, all without getting in your car. Luxury Master bath with Chromatherapy Air Tub, Steam Room/Shower with Rain and Massage Shower Heads. Gourmet Kitchen. Two sets of Washers & Dryers. High Speed Broadband Wireless Internet. Outside shower. Off street parking for 5 cars. No Streets between you and the Ocean. Over 750 sq. ft. of outside decks consisting of main deck off living room, two bedroom decks and one rooftop deck. Twelve beach chairs on site and available for guests use. Two hot water systems, one for outside shower and main level, one Endless hot water heater system for master bath and bath on top level. Fantastic location!! With beach so close!!! Spacious rooms for a large active family. A warm and comfortably inviting house with exquisite master bath, wonderful master bedroom and very nice additional bedrooms. Great kitchen and plenty of room to enjoy meals as family. During a particularly hot weather week, home was comfortably cool....and the decks were great! What a fun vacation for all. Beautiful house that came equipped with everything we needed. Super location too. We had a great stay at Bethany Beach! Thank you so glad you had a wonderful vacation ! Best rental the "Women Want Waves" gals ever rented! 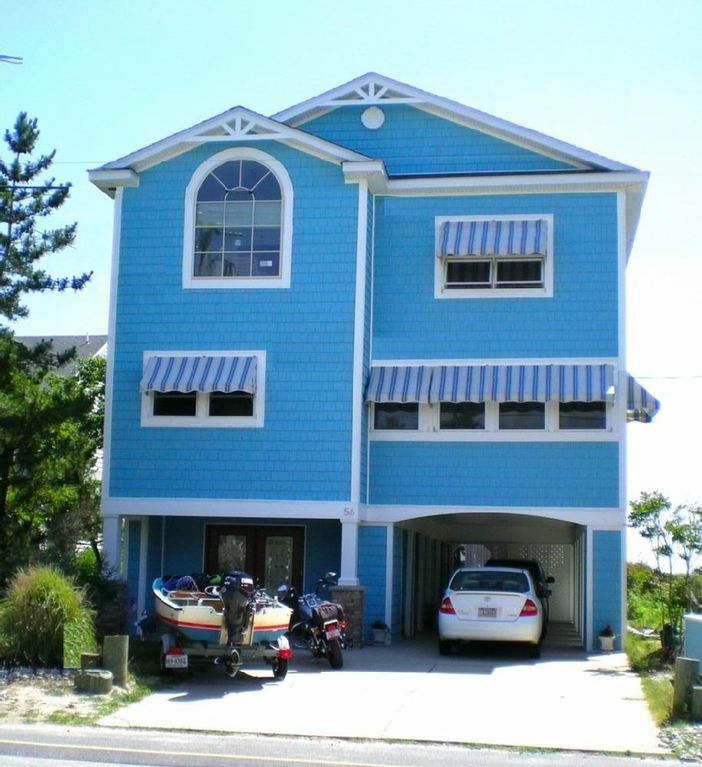 This will be our 15th year coming to Bethany Beach; we're so grateful we'll be renting the Big Blue House again.......think our 5th year in this house.....I'll have to ask Weezy! We spent the week of June 13, 2009 in this beautiful home and hope we can return in the future. The week was planned for my daughter and some of her friends who graduated from high school, so we needed a home that provided excitement for them as well as relaxation for us. This home has it. My husband and I enjoyed the deck space so much, that we never actually made it to the sand. The boardwalk is very nice and the shops have a "hometown" feel that everyone loved. But my favorite attribute had to be the the master suite! I love the shower and jacuzzi tub! Even in a home with 5 female graduates and 3 boys, my husband and I actually had a very relaxing vacation! Thank you John for sharing this fabulous home with us, and will definitely recommend your home to our friends. We stayed at the Blue House the week of Sept. 20-27, 2009 and had a fabulous time. The House was awesome, weather was great and even though we had several families together, there was plenty of room for all. There are numerous decks to relax upon and from the upper one, you can see the ocean, quite beautiful. Bethany Beach was great as well, very family friendly area, beach and board walk are so close to the house, all I can say is location, location, location. House is well appointed, kitchen is fantastic, great room is open and master bathroom truly needs to be seen. Will stay again next time we vacation in BB. I spent the first week of September in this beautiful house. Cannot wait till next year. Once I arrived, I never got back in my car. Walking distance to downtown. Steps to a beautiful beach. Great bike trails. The gourmet kitchen was amazing, as was the master suite and bathroom. I loved the three decks with their view of the ocean. Plenty of room for large families. The owner has thought of everything, to include plenty of beach chairs, bikes, and two outdoor showers. Truly fabulous.